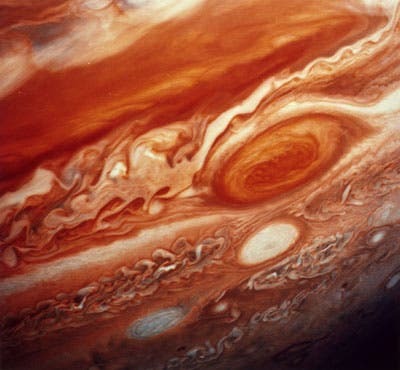 The gas giant, Jupiter, which is twice as massive as all of the other planets orbiting the Sun put together, has a central core comprised of iron, rock and ice submerged in a fluid of hydrogen and helium under intense pressures about 40 million times greater than atmospheric pressure on Earth, and temperatures around 16,000 degrees kelvin — hotter than the surface of the Sun. Planetary scientists Hugh Wilson and Burkhard Militzer of the University of California, Berkeley predict that the core may be dissolving into a liquid and may be smaller now thatn when the planet was younger. The team has performed quantum mechanical calculations to try and work out how one of the key ingredients of the core, highly soluable magnesium oxide — responds in such an extreme situation. “For large exoplanets exceeding Jupiter’s mass, higher interior temperatures promote both solubility and redistribution, implying that the cores of sufficiently large super-Jupiters are likely to be completely redistributed,” say Wilson and Militzer. In 2016, when NASA’s Juno spacecraft could verify their theory when it reaches Jupiter and begins to measure its gravitational field.